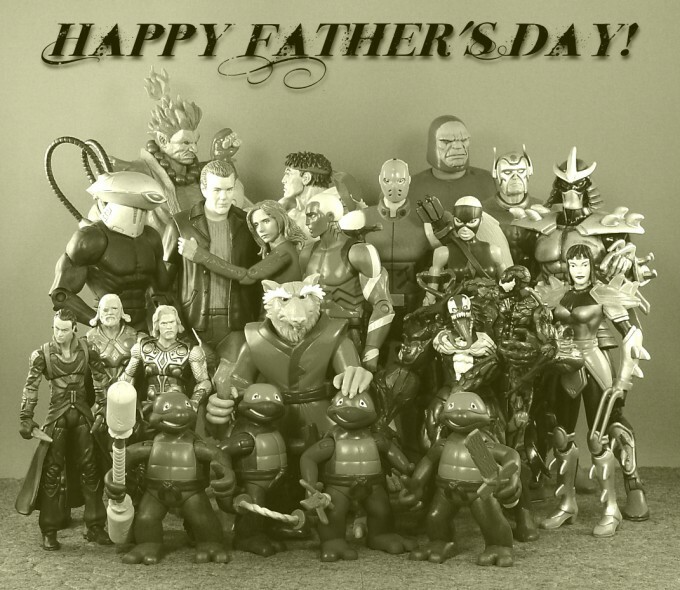 So I hadn't originally planned to do anything special on the site for Father's Day -- not that this constitutes anything special -- but then inspiration struck and I decided to do an action figure photo of fathers and their kids. If it were just fathers, that'd make almost any male figure fair game... but even with the kid qualifier this is by no means the full set of paternal connections among my toys. Heck, my DC collection is pretty small, and yet I probably have enough father/child pairings among them to fill a shot exclusively comprised of DC characters -- especially if I included Batman and Robin(s); Superboy and Superman/Lex Luthor; and other relationships along those lines. Since I didn't want the DC figures included in this pic to be standard hero pairings (Batman/Robin, Superman/Superboy, etc. ), I went with blood relationships and villainous dads (and even then I had to leave out Deathstroke and Ravager). 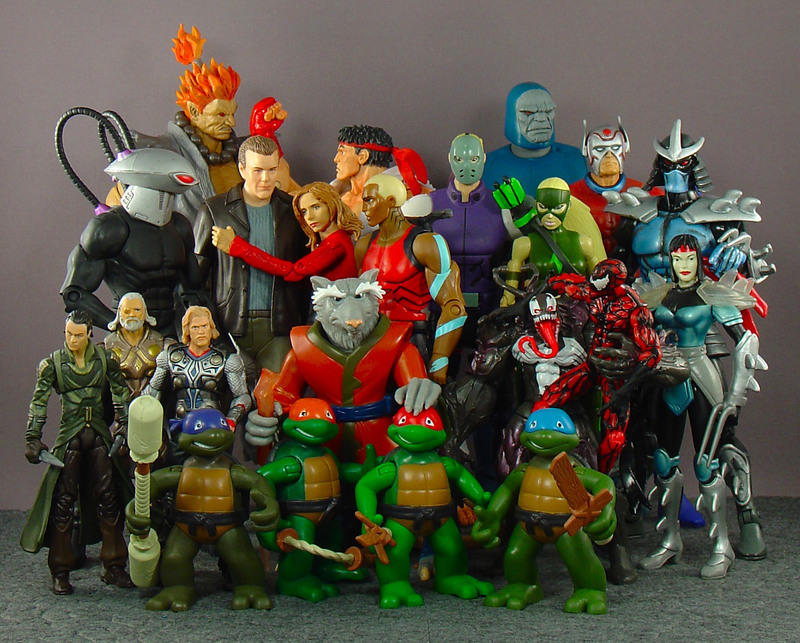 As far as the non-DC figures go... well, you probably know who they are so I won't keep rambling. Ask in the comments if you don't recognize a character and would like to be clued in! And -- of course -- best wishes and happy Father's Day to all the dads out there. Great shot. Love the Thor-Loki-Odin pic. 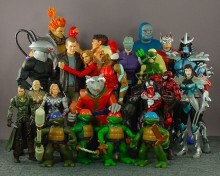 And which series do the Turtles come from? They look mighty adorable! Those are the Turtle Toddlers from the 2K3 series -- they came in a 4-pack. They're pretty lacking in articulation (not that most of the 2K3 figures weren't), but they are indeed cute! And yeah, I was pretty glad I got struck by the last-minute inspiration to include Odin and his boys. I kinda wanted to include Corsair, Cyke, and Havok too, but I didn't want to dig them up after spending way too much time rounding up the tiny Turtles' accessories! Since when is Akuma Ryu's father? Ryu's father was killed by Akuma and thats one of the reasons ryu trains so hard is for vengance against akuma for the defeat of his Sensei and his fathers death. I'm glad you noticed that! Akuma was strongly hinted to be Ryu's father in Street Fighter Alpha: Generations. It's not canonical (in that it's not illustrative of the events/backstory of the game series), but that's my justification for including them as such in this pic. I've never heard that Akuma actually killed Ryu's biological father, though. What's that from?